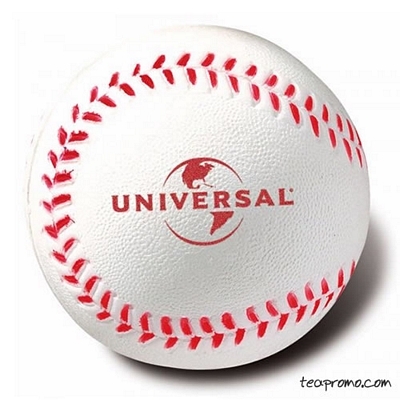 Promotional Baseball Stress Ball. These are handcrafted polyurethane foam stress balls and promotional stress relievers are a fun way to promote your company, organization, hospital or school. At the same time, everyone who receives one can squeeze away the stress of everyday life! Hundreds of creative shapes are available to meet the needs of any promotional advertising program. Item Size: 2 1/2" dia. Shipping Weight: 100 units is 11 lbs. If your ordering a "Less Than Minimum" quantity order that is either personalized (printed) or blank (non-printed), please place your order by phone or Request a Quote. Promotional Baseball Stress Ball, Item #SB302 made of a flexible polypropylene foam this stressball is swooshy and flexible. Our Customized Stress Relievers make the perfect office advertising for a themed sports event.